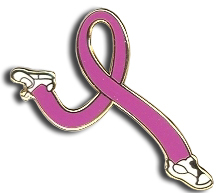 Buy this Breast Cancer Awareness Pink Ribbon Running Lapel Pin. This pink ribbon lapel pin with running design is 1 1/8" gold plated lapel pin with hand applied enamel color fill, butterfly clutch backing, and is individually poly bagged. Please note the color in the picture, this item is the same color - it has some purple in the pink. The Running Ribbon symbolizes the race run by those diagnosed with breast cancer. It represents those that have lost their race with breast cancer, those currently running their race against the disease and those who don’t know they have a race to run. After originally being diagnosed with breast cancer in 1997, 3 time survivor Judy Pickett, ran her first Race for the Cure in May 1998. On that day the Pink Ribbon Running Club was born. Judy made it her life goal to run in 100 breast cancer benefiting races around the country. When she reached 100 things did not stop. As of February 2008 she’s run 124 races, winning the survivor division 95 times. Judy has run with over 2,230,000 people and 113,000 survivors, in 41 states. They are absolutely fantastic. We ALL loved them. Best UsesWe wear them proudly as a team to show our support from the gym for the Moms on the Run.